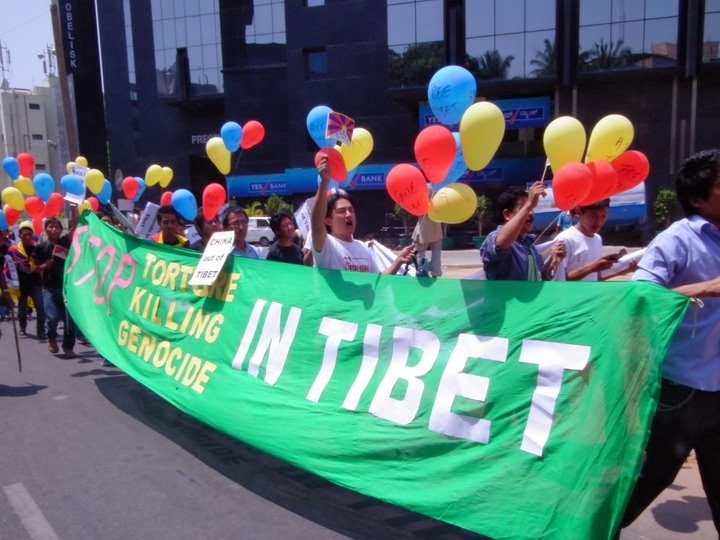 A decade back, no one would have thought merry-making Tibetans would resort to such gruesome campaign of setting themselves on fire in protest against the Chinese government. But the world witnessed more than one hundred of Tibetans; mostly monks and youngsters set themselves on fire calling for the return of the Tibetan spiritual leader, His Holiness the Dalai Lama from exile and freedom in Tibet. Few of them even jumped into the river! The gruesome campaign captured the world media to some extent, but failed to generate any help from the governments of the world to end the ongoing Chinese repression in the Himalayan country. Observing that the movement is leading no where, many of the Tibetan leaders including Gyalwang Karmapa, the third highest spiritual leader in the Tibetan community called for an end to the self-immolations. Being asked, Tenzin Tsering, a member of the Tibetan Youth Congress, the leading exile Tibetan organization for freedom in Tibet said Beijing's policies towards Tibetans in Tibet are the root causes of these chain of self-immolations in recent years. "China always say Tibet is an integral part and parcel of mainland China, but when it comes to their policies, they always consider us as non-Chinese," said Tenzin Tsering. Tenzin is right. Beijing government has lately shown a much patient-face towards the protesters in the mainland area whether it is a civil rights movement or political protest. However, protesters in the Tibetan area have been encircled, put down under gun point and even in few cases--the armed Chinese police openly fired on the peaceful protesters within minutes of a demonstration. Tibetans especially the Tibetan youth congress is losing patience towards the Beijing government. Recently, the organization announced to start a peace-march from Dharamshala, the base of the Tibetan government in exile to the Indian capital New Delhi where all the foreign embassies including the Chinese embassy are located. The march is scheduled to begin in early February. Not more than two years ago, a 27 year old Tibetan young man, Jamphel Yeshi burned himself in front of thousands of people, during a similar peace march in the Indian capital organized by the same group. Yeshi was succumbed to his burn injuries. As it is said many Tibetans in Tibet are in line to set themselves on fire if Beijing refuses to address the plight of the people inside Tibet, Tibetans in exile are also likely to be emotionally enforced to embrace such fiery protest especially during such upcoming peace-march protest where Tibetans from all walks of life are gathered together,empowering each other to resist the repression in their homeland. However, the Harvard graduate, Tibetan prime minister Lobsang Sangay as well as the Tibetan spiritual leader the Dalai Lama in recent months give off the impression that there is more hope with the new Chinese leadership than the previous ones. Despite lack of response from the Chinese side, the Lobsang's administration under the blessing of His Holiness the Dalai Lama is adamant to remain their doors wide open for negotiations with Beijing which they hope will someday pay off well. NOTE-- The article is initially published in TCDailyPlanet, a local news portal based in Minnesota, U.S.A.